The Col de la Croix de Fer (2,067 meters) connects the Isère and Savoie regions. The area – on both sides – attracts many cyclists, as there are many famous climbs to be found, besides this one. In Isère – centered around Bourg-d’Oisans – these include the Lautaret, Les Deux Alps, la Bérarde and “the most famous of them all”, the Alpe d’Huez. In the Savoie region, centered around Saint-Jean-de-Maurienne, you’ll find – among others – the Glandon, Télégraphe / Galibier and the Madeleine. The Croix de Fer has featured in the Tour de France 17 times since 1947, most recently in 2017. In 2015 it was included in 2 stages: stage 19 via the Col du Glandon from la Chambre and stage 20 from Saint-Jean-de-Maurienne. The northeastern approach from Saint-Jean-de-Maurienne is 30 km long, with an average gradient of 5.1%. Just past the last and longest of a series of 3 tunnels, you can make a little – scenic – detour, by taking the right turn over the D80B, direction Saint-Jean-d’Arves (la Tour / la Chal) / “Route Panoramique”, rejoining the “classic” route at Malcrozet. I barely managed this ascend in 2012, when I was recovering from a bad crash – the Alpe d’HuZes team trained in the area for a few days and some of us combined this with the climb up the Alpe d’Huez. At the time, it had only just opened up, but the summit was snow covered and freezing cold, the descent a menace to anyone’s health. Still, the views higher up are fantastic and this climb should be on your “to do” list. The approach from the southwest starts in Rochetaillée – after a flat warm up of some 3.5 kilometers and a short sprint up the barrage du Verney, the actual climb starts. From there it’s 27.5 kilometer in length, with a moderate average gradient of 4.7%. However, this side has – besides the inevitable “flattish” sections – one more serious drop (100 meters) and a lesser drop (50 meters) – taking those into consideration, the average gradient rises to 6.8%. This part, leading up to the barrage and the breathtaking view on the Lac de Grand Maison, is also the only part were you will find some picture worthy hairpins. Other than that, the road is pretty much straightforward, almost meandering like a stream. Some 2.5 kilometers before the summit, you’ll pass the left turn up the final meters of the Glandon. Although the average gradient on the “home stretch” is only just over 6%, the wind can make those final kilometers of the Croix de Fer quite hard. Video from the Col Collective. Another route leads over the Col du Mollard. You can chose to start in Villargondran and take the D80, or take the D110 out of Saint-Jean-de-Maurienne. The latter joins the route over the D80 at Albiez-les-Vieux and both join the classic route at Belleville, some 14 kilometers from the summit of the Croix de Fer. Profiles on ClimbByBike: D110 / D80. The Mollard can also be included when going in the opposite direction, i.e. not descend the full length of the Croix de Fer, but take the fork over the Mollard at Belleville. This is also often the case when a Tour de France stage goes on to pass over the Galibier or heads for Modane. This climb is some 6 kilometers long, at an average of 6.8%. Another tough alternative is the approach from the north (La Chambre, Saint-Etienne-de-Cuines) via the Col du Glandon: 20.3 km at an average gradient of 7.3%. 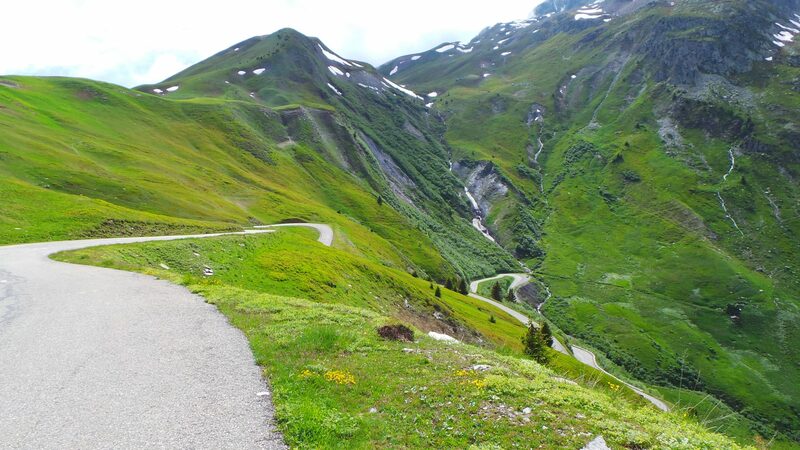 The final 2.5 kilometers of the Glandon are often referred to as “hairpin heaven”, but they are also painfully steep, averaging 11%. Profile on ClimbByBike (the gradient is off, as the distance used to calculate it is incorrect).